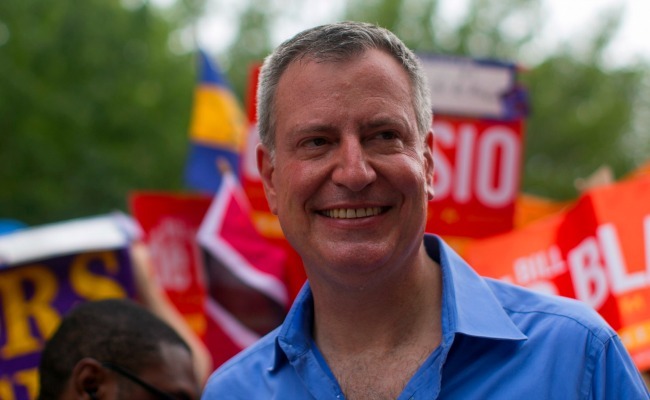 Who Is Bill de Blasio, and Could He Be New York's Next Mayor? The newly minted Democratic frontrunner is a populist progressive and yuppie dad whose son has an awesome Afro. The surprise new leader in the New York mayoral race is Bill de Blasio, a yuppie Brooklyn dad who’s running as a crusading liberal. The Democratic primary is on Tuesday, and suddenly de Blasio, who spent most of the race mired in third or fourth place in a crowded field of candidates, is way out in front. A Quinnipiac poll released this week put de Blasio, the city’s public advocate, at 43 percent, trailed by former Comptroller Bill Thompson (20 percent) and the long-presumed favorite, City Council Speaker Christine Quinn (18 percent). Remember when Anthony Weiner rocketed into the contest, then flamed out spectacularly? He’s down to 7 percent. If the poll is right and de Blasio gets more than 40 percent of the vote Tuesday, he will become the Democratic nominee, heavily favored to win the general election in a city where 68 percent of voters are registered Democrats, just 11 percent are Republicans, and New Yorkers, while generally satisfied with the city’s direction, are ready for a change after 12 years of Mayor Mike Bloomberg. But the primary electorate is difficult to poll with much precision, and even de Blasio’s campaign expects he will get less than 40 percent, putting him into an October 1 runoff with the second-place finisher. Despite being a fixture of the New York’s tumultuous politics for more than two decades, de Blasio remains largely unknown. Here are eight things you might not know about the man who stands a good chance of becoming the next mayor of America’s largest city. 1. It’s pronounced “de BLAH-see-oh.” As in “aardvark,” not “anteater” or “A-rod.” (More on the Yankees in a minute.) And it’s not his birth name: Originally Warren Wilhelm, he was always called “Bill” by his family, and he took his mother’s maiden name after his father, whom he has described as an alcoholic haunted by his experience serving in World War II, left when he was young. “He had these demons that he couldn’t beat,” de Blasio recounted in a campaign video. 2. He has a diverse family. De Blasio’s wife, Chirlane McCray, is black, and she and the couple’s biracial children -- Chiara, a college freshman, and Dante, a high-school junior -- have featured heavily in the campaign. The campaign’s first TV ad featured Dante -- who sports a majestic Afro -- praising his father’s policy proposals. The Afro became a sensation in the campaign, and the New York Daily News even accused de Blasio of “cashing in on [his] son’s hair.” According to the campaign’s research, de Blasio would be the first New York mayor in history with a child in the New York public schools. McCray, an activist, spoken-word poet and writer, was a lesbian who wrote about her sexuality in Essence magazine in a 1979 essay. But when she met de Blasio in 1991 -- he was an aide to then-Mayor Dinkins and she was working for the city’s human-rights commission -- she fell in love, she told Essence earlier this year. “I thought, Whoa, what is this?,” McCray said. “But I also didn't think, Oh, now I'm attracted to men. I was attracted to Bill. He felt like the perfect person for me.” McCray and de Blasio say their families struggled to accept their relationship at first. 3. He’s the Brooklyn candidate. Lives in a Park Slope brownstone. Drives a hybrid. Put his kids in a childcare co-op. Drinks organic milk, grows vegetables in his yard, recycles. All the signifiers of socially conscious, bourgie Brooklynism are abundantly embodied in de Blasio, whose easygoing affect just adds to the Brooklyn-dad vibe. In his campaign, de Blasio has branded himself the candidate of the outer boroughs, channeling residents’ resentment of the Manhattan-centric prosperity of the Bloomberg years: “We’ve seen a pattern, under the Bloomberg administration, of favoring Manhattan over the outer boroughs,” he said at a recent campaign stop. It’s a line that cleverly positions de Blasio as the candidate of both the outer-borough working classes, including many white-ethnic and minority voters, and the educated white liberals who have increasingly taken over Brooklyn neighborhoods. On Saturday, de Blasio’s campaign released its official get-out-the-vote Spotify playlist, featuring such hipster-beloved bands as Vampire Weekend, Florence + the Machine, and LCD Soundsystem. 4. He’s an operative. De Blasio got his first taste of politics working on the Dinkins' 1989 campaign. After working in the Dinkins administration, de Blasio ran New York for Bill Clinton’s reelection campaign, then took a post in the federal Housing and Urban Development department under Andrew Cuomo, who's now the governor of New York. In 2000, de Blasio served as Hillary Clinton’s campaign manager when she ran for the U.S. Senate. With Clinton dogged by accusations of carpetbagging, de Blasio appears to have been picked as much for his New York bona fides as his political chops. While Clinton won by 12 points, de Blasio was quietly, unofficially pushed out of the campaign-manager role near the end amid concerns that his laid-back, consensus-driven management style was insufficiently decisive. Neither Cuomo nor Clinton has endorsed a mayoral candidate, but de Blasio is said to remain on friendly terms with both. He’s since switched from strategist to political actor, joining the City Council in 2001 and winning the public-advocate position against a better-known opponent in 2009. His political savvy is apparent in the way he’s come from behind to dominate the mayoral contest; even opponents say he's run a smart campaign. 5. He’s running to the left. De Blasio’s refrain is that New York under Bloomberg has become "a tale of two cities,” and his signature proposal is an ambitious plan to raise taxes on those making more than $500,000 and use the funds to create a universal pre-kindergarten program. He also proposes using zoning rules to force developers to build affordable housing, and ending Bloomberg’s stop-and-frisk crime crackdown, which critics call discriminatory and a judge ruled unconstitutional last month. 6. He’s accused of hypocrisy. As de Blasio has risen in the polls, his rivals have portrayed him as insincere, seeking to undercut the sense of conviction that is his most appealing trait. Quinn is airing ads that accuse him of taking donations from the same developers he decried as slumlords, and of changing his tune on stop and frisk, which he once called a “valid policing tactic.” (The ad cuts off the quotation there, but de Blasio said in the next breath that he would “change the nature of it.”) Her campaign started a Tumblr called “A Tale of Two de Blasios,” while another opponent, former Comptroller Bill Thompson, has a website not-so-subtly titled BilldeBliar.com that accuses de Blasio of failing to disclose meetings with lobbyists. The hypocrisy charge is echoed by some former colleagues, such as state Senator Tony Avella, who served on the council for eight years with de Blasio and told City & State magazine: "I don't think he's always been this progressive, but it's interesting how candidates can remake themselves when they're running for office. It's revisionist history." 7. Celebrities love him. De Blasio has been endorsed by Alec Baldwin, Susan Sarandon, Sarah Jessica Parker, Steve Buscemi, and other stars. Other candidates also have celebrity backing -- Quinn got the coveted Lena Dunham endorsement -- but de Blasio is the only one to release a shameless highlight reel of all his famous friends. 8. He’s a Red Sox fan. De Blasio and his wife both grew up in Massachusetts, and he has remained an ardent fan of his onetime home team despite the hatred it inspires in the Five Boroughs. Bloomberg, who also grew up in Massachusetts, once harbored a soft Sox allegiance, but ditched it as mayor and isn’t particularly into baseball. De Blasio is different -- a member in good standing of Red Sox Nation. He raised his kids as Sox fans, has taken them to Sox spring training, and -- after a bet on the outcome of a Yankees-Sox playoff series -- once forced a City Council colleague to deliver a speech praising the Red Sox. De Blasio’s campaign gamely spins this as another instance of the candidate being true to his convictions, but to the Yankee fans that dominate the city, it’s hard to imagine being led by a Sox fan. “Last night, while my heart was breaking, he was probably overjoyed,” sulked Bill Cunningham, a longtime New York Democratic consultant who offered an otherwise upbeat assessment of de Blasio. (The Red Sox launched a four-game series with the Yankees with wins in Thursday and Friday’s games.) “Perhaps he’s not the right person to lead New York after all."